The Top Running Single Girder (TRSG) Single Leg Gantry (SLG) Crane and the Top Running Double Girder (TRDG) Single Leg Gantry (SLG) Crane - known as the "Semi-Goliath Crane"- is an application specific solution that minimizes floor space intrusion. 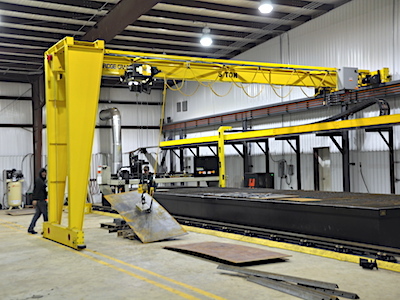 With spans of up to 60’ and capacity to 15 Tons, Single Leg Gantry Cranes can provide an effective solution to a challenging lifting problem. 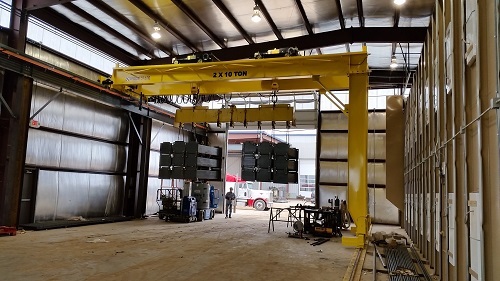 Single Leg Gantry Cranes under 50’ spans and 10 Ton capacity or less can be installed on most concrete slabs without the use of a floor track system.